That's what I think about his visit. He didn't go visit the usual people billionaire business men visit when they go to another country on business. He made it look very ordinary and you wouldn't know that he is over ten times richer than Donald Trump. He is worth a whooping $54 billion. In Naira, that is N16.2 trillion at N300/$ exchange rate. So why did he come to Nigeria? Well, we will have to ask him to know for sure. But Mark is generally like that. About two years ago, he learned Chinese just so he could talk to the tech community in China in Chinese (and maybe his wife too). He shows an above average care for the culture and people he is evangelizing Facebook to. Last year, he spent one month in India visiting the entire country. I don't think he came primarily to checkout Andela and validate his $24 million investment in the company. What is $24 million to him? Plus, it was by his foundation and not his core business/company (Facebook). Recently, Facebook has been on a mission to grow from its least saturated markets. When you've got over 1 billion users and face fierce competition in the developed countries, you can only seek growth from countries like Nigeria, India and other developing countries where there is still a sizable green market (people who have not yet connected to Internet). So Facebook is building free internet balloons. 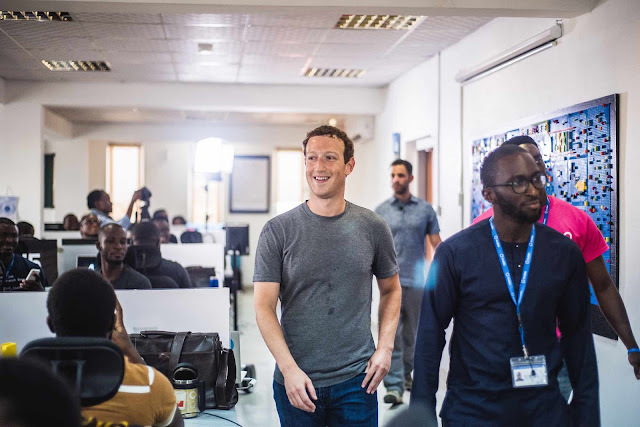 Facebook is partnering with local telecoms and ICT companies in the developing world to come up with very cheap (almost free) ways to connect to Facebook. Mark is Facebook's chief evangelist. He's strategy is a little more like Richard Branson's. He is his company's main marketer. He tries to use his big profile to connect more intimately with people (current and potential customers). He delegates most of the core day-to-day running of his company and do a lot more of marketing/evangelism. Or how would you interpret a CEO making out time to learn the hardest language in the world (Chinese) just so he can connect more intimately with the audience when he paid a similar visit to China? What do I think about what people have been saying about the visit? I have been seeing a lot of people saying (online and offline) that rich Nigerians should learn from Mark's humble actions of quietly going round places in Lagos that they wouldn't go without escorts and paraphernalia. I think is not correct. First, no Nigerian rich man goes to USA or UK or even India with funfair and escorts. They also go in quietly like Mark did. Second, if Mark is planning to stay for weeks in Nigeria and don't want to become easy prey for daredevil criminals, he will soon need to have noisy escorts and those paraphernalia. Even in his home country (USA) he doesn't live in the equivalent of Yaba or Surulere or even Lekki. He lives in the equivalent of Banana Island. A neighbourhood only for the super rich. Third, he is simply doing what any sane person would do and what every other big multinational Nigerian business man does. Make the most of your time. Quietly visit the most important stakeholders in your business operations in the country you visit. Connect with the people that matter most and get out.